OzHarvest Canberra is celebrating its ten-year anniversary of supporting the ACT and surrounding region. OzHarvest is a big yellow family made up of passionate people with huge hearts, who believe good food should not go to waste, while so many are still hungry. Hotel Kurrajong Canberra will be hosting a fundraising evening on Friday 12 April from 5.30pm - 8.30pm. The night will feature live music and entertainment, canapés and live cooking stations, beverages from local winemakers and most importantly, great company and fun! 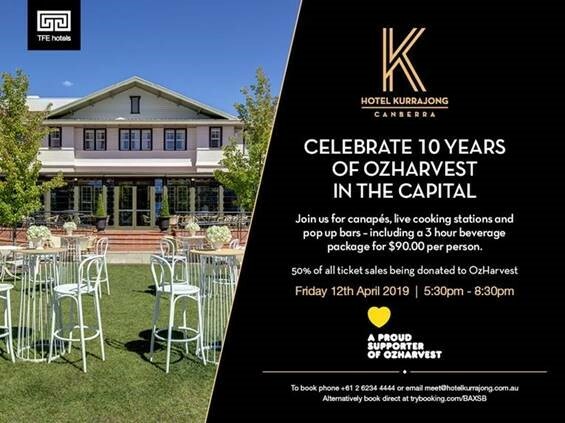 Tickets are available here for $90.00 per person with 50% of all ticket sales being donated back to OzHarvest and the Canberra Community.